The frame on this elliptical is solid and handles my 250 lbs without any problems. I have already lost 15 lbs so lets hope for continued weight loss!!! 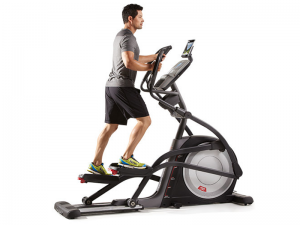 With the android touchscreen built into this elliptical it makes it extremely easy to use. All you need to do is select your workout and your off. I also like the ability to surf the web. I work out in the morning so I can catch up on all the news before I head into work. I also like the extra long warranty that the 16.9 Elliptical comes with. It has a lifetime frame and 6 years on parts. Other similarly priced ellipticals from other companies that I looked into only offered 3 year parts warranties. Solid construction. Touchscreen is the way to go.